This is the Christmas Card I sent my parents last year. 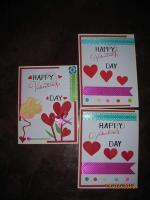 All that we require is card stock - in three different colors. Even a single color would work. It depends on your taste. 1. 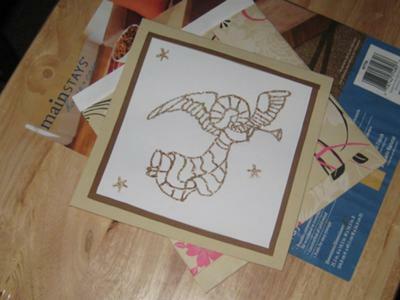 Draw the angel on a piece of paper (or card stock) using pencil. 2. The pencil mark is invisible, as golden glitter glue is applied on top of it. Good luck, all the card- makers! Have Fun and bring a broad smile onto the receiver's face. 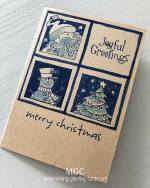 Thank you, Sindhya, for sharing this Christmas card with us. 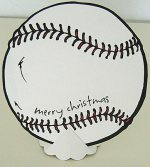 Simple to make and yet so elegant a card. I love the idea of going over the hand drawn pencil line with glitter glue. 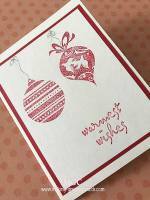 And your layering brings this simple yet elegant handmade Christmas card together so perfectly. Thanks Flora, for your comments and encouragement! Join in and write your own page! It's easy to do. How? Simply click here to return to Christmas Cards.